A tag card to fit the Spring Color Challenge over at the Mod Squad Challenge Blog. I chose purple and the two shades of teal. So pretty! Love the teal and purple combo, never tried that! The butterflies and doily make is so feminine. Have a blessed Easter. What a gorgeous tag! Love it! 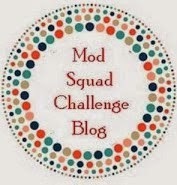 Thanks so much for playing along in our challenge at the Mod Squad Blog this week!